Willie looks like he's eyeing this article and he might pull that bandana down around his right eye when he reads about how much fun we had with "umpapa" German music. Someone told us that we can't miss this year's Wurstfest in New Braunfels so we headed to New Braunfels and a had a fantastic time - golf at the Bandit, some great food, lots of music, and too much beer. If we were going to be in New Braunfels for Wurstfest, there was no way that we could pass up a round of golf on one of our Top Rated Texas Golf Courses. And since they now have a stay and play we decided to stay one night there before going to Wurstfest. The Bandit Golf Course is one of those courses you can't forget because almost every hole is challenging, unique, scenic, and memorable - and it now has several of my golf balls, which I'll never forget. The conditions are great, the greens are fast and very difficult, the service is country friendly, and the rates are reasonable - how can you beat that! Read our review of The Bandit to learn more about why we love this course. We stayed in The Lodges at The Bandit and our three bedroom condo overlooked the 10th fairway and it's huge bunker! I sat on the balcony and made bets on how many fellow golfers would land in that bunker like I did, then curse, and take a wild swing only to knock more sand out of the bunker and look up and see your ball still buried in the sand! Our condo was very clean, well appointed and nicely decorated, and included a well stocked open concept kitchen (full refrigerator, microwave, oven, toaster, pots and pans, and lots more), living and dining area, 3 bathrooms, and a soft comfy bed! Here is a link to our Review of the Stay & Play at The Bandit. After playing golf so poorly, I was ready for a few drinks and some good food. TripAdvisor, Urban Spoon, and a couple other people we talked to recommended Huisache Grill and Wine Bar. Huisache is in an old house and has a very unique menu, beer and wine, a quaint and cozy setting, good service, and some tasty food - all at what we thought were reasonable prices. I loved the mixed grill - two 2-oz. beef medallions, a semi-boneless blackened quail, three skewered spicy shrimp, and poblano bacon wrapped chicken and served with sliced jalapenos, apricot dipping sauce, new potatoes and a vegetable medley. After stuffing our tummies, we wobbled across the street to Pour Haus which is rated "the best bar in New Braunfels." This is our kind of place - large outdoor area with fire pits, swing seats at the outside bar, wooden chairs, bocce ball and bean bag toss courts, and live music - oh, and cold beer at a reasonable price. We sat by the fire and under one of the space heaters (it was very cold for this early in November) and listened to a pretty good band. After a set at Poor Haus we were cold and ready to move indoors so we moseyed up the block to AJ's Ale House to listen to a "rock & roll, sing-along piano show" and of course try a couple beers from what they claim is "one of the largest selection of beers in Texas." Wow - what a blast. The piano player and his drummer were excellent, great voice, fun songs, lots of enthusiasm, and he knew how to get the crowd involved! It was fun and it's amazing how after a few beers we weren't afraid to sing at the top of lungs even though we really can't carry a tune! We felt a little fuzzy the next morning and went in search of the best breakfast spot in New Braunfels - the over whelming winner was Union Street Station. We waited almost an hour to get in but we sure enjoyed the food. They offer 55 different omelets, huge waffles, gigantic pancakes, cinnamon rolls, and some of the best Migas I've tasted. I was starting to feel better! After breakfast, we checked into our cottage at Hill Country Cottages and RV Resort. We stayed in a 2 bedroom, 2 bathroom, fully furnished cottage that could sleep up to 8. Clean, comfortable, and much better than staying in a small expensive hotel room! And Hill Country Cottages & RV Resort has 3 pools, a sauna and hot tub (what a joy after all the beer at Wurstfest, AJ's, and Poor Haus), game room, volleyball court, and more. 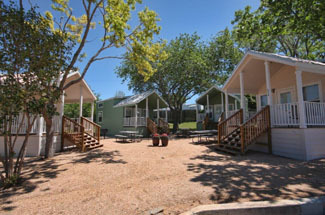 Read our review of Hill Country Cottages and RV Resort to learn more. And there was a shuttle that ran back and forth from Wurstfest. It is impossible to not have a good time at Wurstfest - over 40 different award winning musicians/bands from around the world, 30 craft beers, lots of food choices, a carnival, arts and crafts, and a lively and friendly crowd. There are 5 stages with music from 11:30 in the morning to 10 at night and all of the bands that we saw were outstanding. They all knew how to get the crowd excited, cheering, and dancing to some lively German music and cheers - the pitchers of beer probably helped with our enthusiasm. Read our review of Wurstfest to learn more about this great festival. After all the beer this weekend, I was happy to see the numerous food vendors at Wurstfest ranging from lots of German food to traditional Texas fare to a mixture of other food. Since this was a German celebration, I felt obligated to stuff my face with a Dusseldog on a Pretzel, Pork Schnitzel, Wurstkabob, and couldn't resist a German Chocolate Cake. At the end of the evening, stuffed full of food and beer, with tired feet from all the dancing, and a raw voice from signing and cheering, as soon as my head hit the pillow I was out like a light bulb. What a fun weekend and a great time at Wurstfest.